Singer/Songwriter/Entertainer John McDonald is new to the Space Coast. In Pittsburgh, John fronted 'the premier party band' (Pittsburgh Tribune-Review) John McDonald & the Mango Men. John loves to perform solo or with a duo/trio/quartet/8-piece band. His live shows feature an extensive repertoire of classic rock from the 60's to the 90's, along with beach favorites by Bob Marley, Jimmy Buffett, Kenny Chesney and Zac Brown. BREVARD COUNTY • VIERA FLORIDA – Singer, songwriter John McDonald will perform his tropical instrumentation, world beat rhythms and positive lyrical themes during February’s Space Coast Seafood & Music Festival at Space Coast Daily Park in Viera. McDonald will feature his own feel-good, up-tempo musical cocktail of reggae, rock and world beat music at the 2018 Space Coast Seafood & Music Festival on Thursday, Feb. 15, from 5:30 p.m. to 9:30 p.m. and Saturday, Feb. 17, from 11:30 a.m. to 3:30 a.m.
Long before he moved to the Space Coast from Pittsburgh, PA, the singer-songwriter was inspired by the Florida sunshine and the tropically inflected music of Bob Marley, Jimmy Buffett, Zac Brown and Kenny Chesney. McDonald has opened for diverse artists including America, The Beach Boys, Hall & Oates and Smokey Robinson. 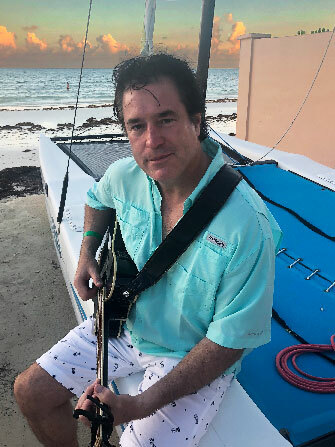 Although his move to Brevard County represents a fresh reboot, McDonald, a Boston native, still loves to deliver a fun, high-energy performance of classic rock and beach favorites. 4:00 PM - 8:00 PM Great venue on the Gulf side! 4:00 Pm - 8:00 PM Sunday by the sea! 4:00 Pm - 8:00 PM On the beach! 1:00 PM - 5:00 PM Landshark Party! 7:00 Pm - 11:00 PM First time since St. Patty's Day!